Howard, along with Chief Executive Officer for Dallas/Ft. 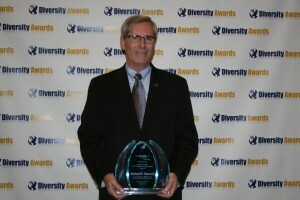 Worth International Airport Jeffrey Fegan, was recognized for being a visible champion of diversity and inclusion not only at the Exchange, but the community as well. Howard was selected also for his leadership as an effective driver of change and great innovator and visionary. The TXDC is a non-profit organization that was established in 2004 to foster a learning environment for organizations to grow in their knowledge of diversity and inclusion. This entry was posted on Wednesday, May 9th, 2012 at 13:45	and is filed under Press Release. You can follow any responses to this entry through the RSS 2.0 feed.